I'd like to start this review with a little confession. This was suppose to be a review of Stone Ridge Creamery's "churned" Cookie Dough Ice Cream. Unfortunately the containers in front were a little beat up, so I reached in the back for a better one. I wound up grabbing a chocolate chip container because it looks almost identical to the cookie dough container. The embarrassing part is that I didn't notice until I cracked open the container and thought "where are all the cookie dough chunks???" Now it's been over two months since Stone Ridge was in the freezer, so let's recap from the beginning. Supervalu owns a whole bunch of grocery store chains, including my local Shaws. Like any nationwide chain, they make their own stuff. 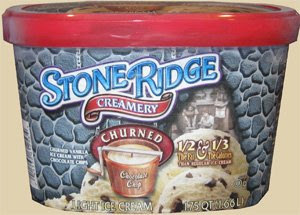 Now I haven't seen the Stone Ridge logo slapped on anything else, so it currently appears to be limited to ice cream, though maybe in your area it's different. The Stone Ridge creamery selection isn't huge, but they do get their own little section. They have a handful of regular flavors, 2 sherbets (orange and orange/lemon/lime), and then their low-fat "churned" flavors. Slow-churned, cold-churned, and double-churned were already taken, so what else where they gonna call it? It says 1/2 the fat and 1/3 the calories...not sure about the calorie comment unless they are comparing it to Ben & Jerry's. For churned flavors, I remember chocolate chip, cookie dough, and an all natural vanilla. I went for cookie dough, but like I said, I missed. I was more than happy to dig into a fresh container of ice cream today. After realizing I had bought chocolate chip, I proceeded with the taste test and I was not disappointed. It's a nice vanilla mixed with a hearty supply of big chocolate chip. I can't even remember the last time I bought a container of chocolate chip, so this was a welcome visit back to an old friend. The texture is fine and it has the off-white color that vanillas can have. Not sure what that means, must have to do with how you apply the vanilla (vanilla bean versus vanilla extract maybe? iunno). Either way, for low fat, it's just fine, especially for an entry level ice cream ($2.99 max, but often on sale for $2.79). So, no real complaints here for this respectable attempt at a low fat chocolate chip ice cream. On Second Scoop: I've actually really been enjoying this ice cream. I think it's the chips that really win me over. I was actually on a chocolate kick and was ready to doss the bowl with Nesquik when I decided to take a bite first. It actually won me over and I decided to keep the lid on the Nesquik. It's plain, it's simple, and it works. I was very pleasantly surprised by the flavor and richness of this new brand. It was offered on sale at the local Shaws for $2.79 for 56oz. I tried to stock up thinking that intro price wouldn't last. It was actually at that price for several weeks. The regular price is much higher, of course, but it is on sale often. I chose the chocolate chip and the chocolate almond and mixed the two in a bowl. Super combo! I can't find the chocolate almond anymore and I'm extremely disappointed. It was loaded with whole almonds. The chocolate was a great flavor--Swiss chocolate maybe? Both the chocolate chip and the chocolate almond were very creamy. The chocolate almond seems to have been replaced by chocolate almond chip which just isn't the same or as good. The plain chocolate had a different chocolate flavor than the chocolate almond and also not as good. All in all it has become one of my favorite ice cream brands. The Butter Pecan is delicious! Stone Ridge has the very best Rocky Road. Our store is limited on the flavors, would love to try the Butter Pecan. I LOVE the pistachio, but couldn't find any the last time I shopped. I hope they aren't discontinuing it or anything like that. I bought butter pecan instead and it's the best BP I have ever had. Can't beat the price so I'm sticking with this brand. i HIGHLY recommend the pistachio flavor. It tastes AMAZING. I bought the mint chip and wasn't impressed. It had a somewhat bland flavor. I bought it for the low price, but I guess you get what you pay for.